In this segment, Bill and I will be discussing the possible timings of the upcoming Middle East wars in relation to the Tribulation. Bill Salus: A lot of people put the Psalm 83 War before the Tribulation and the Rapture before the Tribulation. Some put the Ezekiel 38-39 Gog-Magog Battle before the Tribulation. Some don't know exactly where to put it. There are good reasons it could happen before and there are good reasons it could happen after. Dr. Ron Rhodes wrote a book titled Northern Storm Rising. Didn't you interview Ron Rhodes on the "Christ in Prophecy" television show? Nathan Jones: Yes, we did, and we talked about Northern Storm Rising (see show). He believes the Ezekiel 38-39 Gog-Magog Battle could either occur before the Tribulation or just into the Tribulation. Dr. Rhodes gives a lot of excellent details, going through every possible time period that this battle could possibly happen and shows how some time periods just couldn't work. For instance, the biggest prerequisite for the Gog-Magog Battle is that Israel has to be dwelling in safety. It's hard to argue that Israel is currently dwelling unwalled and in safety, so they have to do something between now and then before Ezekiel 38-39 can happen. Israel needs that peaceful precondition. Another example, once those invading armies are defeated by God miraculously, Israel burns the weapons as fuel for seven years. We know 3 1/2 years into which is the middle of the Tribulation the Antichrist will drive the Jews out and they will flee to Jordan. How could they so easily enter Jordan unless they have some control over it as the result of a previous war? Anyway, that would only give Israel 3 1/2 years to burn the fuel, so we have to back the Gog-Magog battle seven years from that point — at least 3 1/2 years before the Tribulation. Dr. David Reagan was the first I've heard bring this possible scenario up. I never had thought about it that way, in that more than likely Ezekiel 38-39 will happen at least 3 1/2 years before the Tribulation begins so they can have the full seven years to burn those weapons. Now, maybe they take the weapons with them down to Petra and burn them along the way. It is open to interpretation. Bill Salus: Jordan is the nation where Israel flees to when they are being persecuted by the Antichrist; Petra being in modern-day Southern Jordan. And so, your argument is that the Jews are going to burn some weapons' fuel along the way, or take them with them for fuel conversion in Petra, though not likely. Nathan Jones: Probably not. It'd be hard to flee carrying 3 1/2 years worth of fuel. Bill Salus: So, therefore, what Dr. Reagan is saying and I've heard Dr. Arnold Fruchtenbaum say this and I concur with them, is that the conclusion and not the commencement of Ezekiel 38-39 will have to conclude three and a half years prior to the commencement of the Tribulation since Israel will be burning weapons for seven years and not likely burning weapons into the second half of the Tribulation. Nathan Jones: A few extra years before the Tribulation would give the Antichrist time, too, to rise to power. If you think about it, if Israel subjugates their surrounding countries and eventually all the rest of the oil rich countries and Russia who is one of the biggest gas producers in the world is knocked out of the picture, Israel will become exceedingly rich. Once Israel owns most of the oil of the world, of course the nations of the world are going to try make peace with them. You would certainly want to, especially when God has made Himself know that He defends Israel. The Antichrist would be a smart man to make a treaty with Israel. That would give some time for the Antichrist to rise up enough in world prominence to make a treaty with Israel and move forward in that relationship just as Daniel foretold in chapter 9. Bill Salus: Right. So, Israel is very possibly going to preempt a strike against Iran? Nathan Jones: They have no choice. I mean, what can they do? Obviously the UN isn't doing anything about Iran's nuclear ambitions and desire to "wipe Israel off the map." They wag their fingers at Iran and say, "Stop it. Stop it. Stop it." And then the next month, "Stop it. Stop it. Stop it." But, they aren't doing anything about Iran. Israel is the world's only hope in stopping Iran. Nathan Jones: In reading Ezekiel 38-39 we see that Saudi Arabia (Sheba and Dedan) are one of the nations that dwell in safety, sitting out and watching the Gog-Magog invasion. I believe the United States is one of those nations that sit it out and see if Israel is going to rescue us or not. We are looking to Israel (although the whole world condemns Israel), we are looking for Israel to save us all in the Middle East. 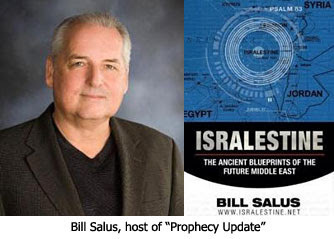 Bill Salus: That's would make sense because we want to have international relationships and commerce, especially if Israel becomes the wealthy Israel that Russia will greatly desire to invade. Whether Israel become prominent because they find oil under their own turf or they conquer nations that already have it, Israel will become exceedingly wealthy. Israel has actually found natural gas off of Haifa via the Tamar-1 site. I heard you talk about that in a radio interview. Israel could also get gas and oil from Arab resources from the aftermath of Psalm 83. Here the United States is possibly connected with the "young lions" of Tarsus. It also uses the word "merchants" in Ezekiel 38:13. We will be wanting to have an economic relationship with a prosperous Israel, the very Israel that Russia comes against. We could be one of the ones like you say who ask Gog, "What are you guys doing? We are trying to establish some stability here and have a financial and economic relationship here with the nation of Israel." Now, it does pose a good point that you bring up. That verse could in part be the United States saying, "What are you guys about to do?" Nathan Jones: Yes, it's always better to let someone else do your dirty work, and the Bible shows that the nations are lazy and are sitting back and letting Israel do their dirty work for them. And, if Israel is destroyed in the process, I don't think the world would bat an eye because they don't really want Israel to exist anyway. For example, UN after UN resolution and a day of morning when they regret ever granting Israel access to the land shows the world's dislike of Jewish existence. But, we know prophetically that Israel's total destruction will never happen. Israel will exist and God's promises will exist. We are talking about blessings that we can trust in. God will fulfill His promises to Israel and He will fulfill His promises to the Church. One of those promises is the Rapture. Bill Salus: Absolutely! Should we be here as a Church and the Rapture does not occur prior to these prophetic Middle East battles of Psalm 83 and Isaiah 17 and Ezekiel 38-39 (should it be a Pre-Trib event), then we need to have courage. The way we could see this play out is that Israel could make a preemptive strike on Iran. Iran's proxies Hezbollah, Syria, and Hamas could retaliate and come against Israel. Israel would then have to act decisively and do something devastating to Damascus. This could easily get the Arab League to convene and draw lines in the Mid-East sand and ask, "Jordan, Egypt, all you Arab League nations, what side of the sand are you on? Israel just did something devastating to Damascus." We could have Psalm 83 actually come right out of that. This gets back to the timing issue. Bill said in his reply to Nathan's question: "Whether Israel become prominent because they find oil under their own turf or they conquer nations that already have it, Israel will become exceedingly wealthy." In order for Israel to become exceedingly wealthy those resources have to be mined, drilled or pumped out, refined and made ready for sale on the world markets. This is an economic process that takes a certain amount of time. Years in fact. And what are the riches which Gog/Magog and those nations come for in Israel? In order as listed by Ezekiel they are: baz (persons and cattle), keceph (silver, money), zahab (gold), miqneh (cattle, livestock), qinyan (all manner of property) and gadowl shalal (great plunder). Gas and oil are not specifically listed among the things Gog/Magog come for, but instead the physical things and monetary wealth most probably acquired through the sale of gas and oil on the world market are. I like paying attention to the details for exegetical insight. What about a Mediterranean, warm water port for Russia? The Russians already have at least one, possibly two eastern Mediterranean ports at their disposal. The Russian fleet used these ports for decades, fell off slightly in the 1990s, but are back again in force. The Syrian Prez was in Moscow negotiating ports for the Russian fleets in exchange for Russian anti-missile battery sites while the world was distracted by the Georgia war. Russia, in spite of the peace treaty to withdraw, still maintains a "Peacekeeping" force to "protect" Russian citizens who live there, blah blah blah... When in reality they're keeping their foot in the doorway because they NEED that corridor to move their Ezek.38 hordes into Israel! This is all long-term planning as Russia has been trying to destroy Israel for a long time thru their proxies - the Arabs. Here's something interesting. Israel has unveiled it's newest Unmanned Aerial Vehicle: the Heron. This thing's as big as a Boeing 737 and can reach Iran. So, if Israel launches an air-strike against Iran, they can do it using UAV's. Their will be no preemptive strike by Israel on Iranian territory for if that were to occur, Russia and Iran would respond militarily. The Prophecy of the Gog/Magog invasion makes it clear that Russia and the rest of the members of the invasion force are drawn to War by the Hand of God. We should also be aware that prior to receiving the "evil thought" recorded in this prophecy, key members of the Gog/Magog invasion force position themselves in a defensive posture yet prepared as a crouching lion to attack should hostilities warrant. The staging point for this assembly will be in Syrian territory. We can also expect that Russia will soon trek south as a guard protecting Syrian and Iranian targets of interest. This will be but another clear indication that the battle to come is the Gog/Magog invasion. It seems that reports indicate that Iranian troops have been given the green light to position themselves in mass in Lebanon, Syria, and possibly Qatar (the later being doubtful). "Their (sic) will be no preemptive strike by Israel on Iranian territory for if that were to occur, Russia and Iran would respond militarily." SOMETHING preempts an Irainian military response to the events of Isaiah 17, Psalm 83 and other prophetic passages concerning the Arab-Israeli war that is a precursor to the Ezekiel 38/39 prophecy. While we know with absolute certainty that Ezekiel 38/39 will occur; we also know that other prophetic events will proceed that occurance. No one can say with absolute certainty that Iran will not be militarily preempted by Israel or any number of other Western nations in concert with Israel or even excluding Israel. It should be obvious that once Russia enters the region, that the strategic picture will have changed dramatically. Russia will provide the nuclear deterrent to any proposed U.S. or Israeli strike on Syria or Iran. I can say for certainty that a preemptive strike will not occur on Iran because of select N.A.T.O. members dependence on Iranian petroleum and natural gas as well as Russian resources. N.A.T.O. is comprised of many E.U. members. The Prophet Ezekiel provides clarification regarding this matter in Ezekiel 38:7, Russia will be both guard and arms supplier to this gathering Gog/Magog coalition. I do not believe their is any other conflict before the Gog/Magog invasion, for me the Psalm 83 scenario portrayed by Bill Salus exists as sensationalism and would not bring Israel peace or stability but would increase terrorism on a much larger scale. The destruction of Damascus as recorded in Isaiah 17 will occur also during the Gog/Magog invasion, it should be clear that though Syria is not mentioned by name in this context, Syrian territory will provide the staging area as well as the forward command center. The area of ancient Bashan or the Golan frontier will be where this great multitude will meet their prophetic end. The initial judgement will be a great earthquake, and Damascus and surrounding cities will be ground zero. Though Israel will also be shaken mightily by this quake, the epicenter will be in Damascus. An earthquake would fulfill the part in Isa. 17:14 which states the destruction would happen within a day. Never thought of an earthquake causing that, so thanks, Rodney. The only caveat to the earthquake theory, though, is verse 9 which says Israel's responsible. Nathan, you will also notice in verse 7 and 8 of this same chapter, that the inhabitants of Damascus and the surrounding cities acknowledge the mighty hand of the Lord God and His willingness to defend the children of Israel. This is not an acknowledgement due to an Israeli weapon being deployed but of the soveriegn power of God, evidently they will not longer question who defends Israel. How does a "great earthquake" cause a city the size of Damascus to become totally uninhabited by human beings and utterly destroy the combat power of the 400,000+ member Syrian Arab Army, Navy and Air/Air Defense Force? Are people still inhabiting and preparing to rebuild Port-au-Prince, Haiti or to the south in Concepcion and a vast 500-mile long area of central Chile? Are the army, navy and air force of Chile still functioning today? Does Isaiah 17 say word one about an earthquake? And why is there the raging of many nations, like the raging of the sea, the uproar of the peoples like roaring waters because of a great earthquake centered in Damascus? On the contrary, the nations of the world would rally on humanitarian causes to assist in every way possible to a great earthquake in Damascus! like tumbleweed before a gale." This is how God the Father of all mankind reacts to humanitarian relief efforts? Sorry, but I'm not buying into this man-made theorem at all. Jeremiah 49 expands on the prophecy recorded in Isaiah 17 concerning Damascus. Therefore her young men shall fall in her streets, and all the men of war shall be cut off in that day, saith the Lord of hosts (Jeremiah 49:26. Sean, I believe the 400,000 strong will find their end as indicated by the Prophet Jeremiah. It is interesting that Syria also is home to several now dormant volcanoes, yet a vast earthquake like recorded in Ezekiel 38:19-20 would without a doubt bring them to life. Anyone with knowledge of what occurs during a volcanic eruption can easily see where great hailstones and burning sulphur enter the equation. The vast mineral resources that Israel enjoys today in the Dead Sea region was a result of such a volcanic eruption such as that which possibly occured in the destruction of Sodom and Gommorah. Perhaps all of you have it right as a majority and I exist as the ignorant minority. I believe very soon we will be able to distinquish which hypothesis is correct. Sean, a ruinous heap illustrates the destruction of an earthquake. In the deployment of a nuclear weapon debris is scattered everywhere, yet the context above indicates structures collapsing on themselves. In addition the rebuke of the nations is also found in Ezekiel 39:6. I believe fire from heaven would send a clear signal to any other nation seeking to prey on Israel during the aftermath of Gog/Magog. I would be more inclined to believe a meteorite shower with a "specially prepared" high sulfur content first [a la Jonah's specially prepared fish], but here again, this could also be written off as an usual "natural" disaster. Also, Syria does not have their entire military in Damascus so unless God rains fire on all of their military bases and fielded armies as a clear act of God [which would probably cause the nations to flee], I would be inclined to go with Judah coming out like a firebrand. Their remains three references of Israel dwelling safely in Ezekiel 38, this word in Hebrew is Betach meaning care, secure, confidence, boldness, yet it can also mean without care, careless, complacent, or a false sense of security. The Hebrew word Betach is again used in Ezekiel 39 in regards to the nations which are dwelling careless and find themselves recipients of fire from heaven. The unwalled villages referenced in the context of the Ezekiel prophecy is not recognized as the cities of Judea but a reference to the modernized settlements of the north. The term city is also mentioned within this prophecy when descibing the city of Hamonah as the burial place of the Gog/Magog invasion force. Why then would the Prophet Ezekiel have a split reference describing cities as well as unwalled villages? It should now be clear that their remains nothing to prevent this battle from being waged, for Israel today dwells carelessly and with a false sense of security. This was the same leading up to the suprise attack by Hezbollah in 2006 recognized as a strategic and intelligence failure by Israel. Now Israel has a visible quadruple threat and heavily rely on political/diplomatic manuevering to secure their borders. I enjoyed the back-n-forth about the distruction of Damascus. I have thought for a few years now, that it could very well be a massive earthquake that will bring this prophecy of the demise of Damascus to fulfillment, especially when you factor in that there is a huge fault line that runs through that region. And, as far as the quake that hit in Haiti, or Chili......don't under estimate the power of God. The earthquake "scale" is based on what man has experienced to present....the one that may or may not hit Damascus could be off the scale! Or, it could certainly all come about by a nuke, I won't rule that out either. All I know for sure is that Damascus will be distroyed...it's gonna happen. Israel living carelessly?!? - I don't think so. Israel "sleeps" with one eye opened, and she doesn't tip her hand on what she's really capable of. Like Churchill and the Ultra Secret, they don't mind a certain level of civilian losses to hide what they really know. TEL AVIV — Israel's military has been exercising for the prospect of a multi-front war. It is more than a decade since I was last in Israel, and they are incredibly tough on security. We were all body searched at the airports. At every stop the chassis of our coach was searched for bombs and always kept guarded. At the Dead Sea we had armed guards. So much has happened since then that the world has learned to adopt their strict methods. So no, they are certainly not 'careless'. However batach (which doesn't mean 'peace') rather 'secure' in my view refers to the fact that the days of walls and moats, virtually worldwide, is no longer a defence of individual towns, so are no longer used. The security ‘wall’ is only an inconvenience and in reality is an easily breached fence as the rockets soar over it. After being insecure, scattered around the world, the Jews are now safely (relatively) back in their own land and able to not only defend their selves, but also to attack if needed with a well equipped defence force. It is more than 2000 years since they could do that for themselves during the Diaspora at everyone’s mercy. I believe this is what ‘betach’ refers to. Personally I cannot accept that Gog is after their wealth. It is Sheba and Dedan that nonchalantly inquires ‘what are you up to, are you after ‘spoil?’ it seems to puzzle them why Gog should want to bother. While the ‘Palestinians’ leader’s, don’t really want the land, they just don’t want the Jews to have it. When forced out of fertile land, the Jews left a thriving produce business with intact homes and greenhouses. All the Palestinians had to do was make a good living for themselves on the proceeds. Yet they bulldozed it all down, even the houses because they prefer to live as they were in tenements, or so their leaders claim. So that valuable ‘spoil’ went unheeded. I do not consider it worth looking for a reason of ‘why’ they want to invade, it is based upon centuries of Satanic hatred, that does not require a reason. It is God who will draw them forth with ‘hooks’ suggesting to me that Gog is reluctant, but will avail themselves in their partnership with the Islamic nations. So I consider there is nothing prophetically from prevent the wars, they have been primed and ready for a long time, it is all down to God’s timing, not their choice. Imo. Jack Kelley -who is an excellent Bible teacher in my opinion- said that not all of Israel will flee to Petra just the believing Jews! At that time believing Jews won't contain the entire israeli population. Those who remain in Israel can burn the remaning weapons in the second half of the tribulation. When the nations will attack Jerusalem at Armageddon, the city won't be empty. There will be these Jews, who didn't flee to Petra. And Armageddon is at the end of the 7 years, so the weapons can be burned till that happens. In this case, Ezekiel 38-39 could happen directly befor the 7 years Tribulation and the 7 years long weapon-burning fits in perfectly. Rodeny, if the people of northern Israel are living securely in unwalled villages why do they have bomb shelters in every neighborhood? The only way they could be secure is if there is no threat. And the only threat is Syria. Gary, or son of thunder, that is precisely my point, they are not living securely, they have a false sense of security or remain careless. Israel at this moment dwells carelessly as their enemies continue to arm at rapid pace and gain strategic advantage. During the Hezbollah conflict in 2006, Israel was taken by suprise with the superior Russian design of anti-tank missiles, which melted down Israeli Merkava tanks like butter with high explosive detonation. Israel was ill prepared for such a conflict. Hezbollah missiles continued to punish the north from well constructed reinforced bunkers on mobile launch platforms. On this occasion, Hezbollah was limited to only having the capability to strike in the north, yet now all of Israel is in the crosshairs so to speak. Do not get me wrong, I love Israel, and the Lord God loves Israel, yet because of complacency on their part, God will have to directly intervene to prevent their destruction. Israel remains this day under a four-pronged threat, with an effective missile umbrella covering their entire territory by Iran, Syria, Hamas, and Hezbollah. The time for the direct intervention by the Lord God is arriving soon as with each day that passes the drums of war grow louder, yet Israel continues to put faith in economic santions and diplomacy to rectify their current deadly situation. The predator can quickly identify the weakness of their prey, the Gog/Magog alliance is watching intently. I think it depends on the interpretation of what is meant by being ‘secure’. For Israel to have confidence; and to feel they are now in a position to do whatever it takes to defend her people brings a sense of security. Scattered through the nations, they were anyone’s target and were physically unable to do little to protect their homes and families, they were extremely vulnerable. Back in the land, they now have a fighting chance to defend themselves. In no way does a quiet confidence in their security measures mean they are at ‘peace’ with no fear of ever being attacked. That will not happen until the Millennium. My home has been made as secure as possible with burglar alarms. Walls and fences alone will not prevent any determined burglar. However, having done all, we stand with the knowledge we are as secure as we can be and get on with life. Same with our vehicles, we set an alarm and lock it, then feel safe enough to leave it standing and go about our business. A prisoner secured in a cell is not at peace with society at all. We are not at ‘peace’ with the criminals; we are ‘secure’ in that we are not an easy target. After that it is watchfulness and hope. The world we now live in defends itself very differently to ancient times when high walls and moats were essential. Modern warfare has put an end to that and now the age we live in, is one where we make ourselves secure without walls and moats. For this reason Israel is living securely without the use of walls and moats. Being made secure does not = peace or deny the risk of attack. This being my understanding of being secure in a fallen world is one reason why I cannot go along with ‘Isralestine’, as much as I like and respect the author.